Looking for a simple, light, and easy fish taco recipe? Here it is! Use your favorite white fish, marinade a day ahead or just before you cook it, and serve with the delicious cabbage salad. As you begin to wean your baby into solid foods, this is one vegetable puree they will be sure to love. It has a nice blend of flavors and you can omit anything you feel won’t work for your little one. Adults: you will enjoy this dish too! 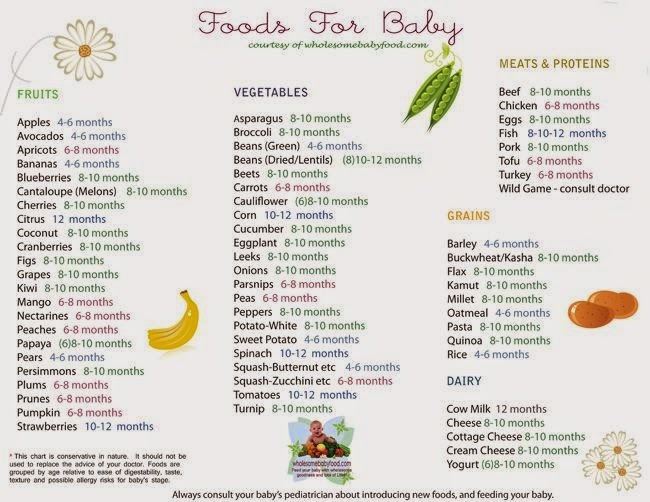 Use this guide to find out what and how much to feed your child in the first year. The amounts are meant as rough guidelines only, so don’t worry if your little one eats a bit more or less than shown. It’s a good idea to discuss your solid feeding plan with your child’s doctor before getting started. Always listen to your doctor first. *These are only suggestions. This is a perfect potluck dish. Everyone loves fresh fruit. Especially when everything is in season. Rachel Schultz adds a special secret ingredient to make this simple fruit salad make fireworks in your mouth. Dry instant vanilla pudding mix. Crowd pleaser!